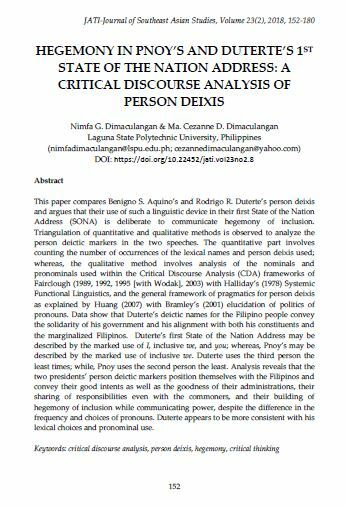 This paper compares Benigno S. Aquino’s (Pinoy) and Rodrigo R. Duterte’s (Duterte) person deixis and argues that their use of such linguistic device in their first State of the Nation Adressesses was deliberate to communicate hegemony of inclusion. Triangulation of quantitative and qualitative methods was observed to analyze the person deictic markers in the speeches. The quantitative part involves counting the number of occurrences of the lexical names and person deixis used; whereas, the qualitative method involves analysis of the nominals and pronominals used within the Critical Discourse Analysis (CDA) frameworks of Fairclough (1989, 1992, 1995, 2003) with Halliday’s (1978) Systemic Functional Linguistics, and the general framework of pragmatics for person deixis as explained by Huang (2007). Data showed that Duterte’s choices of deictic names for the Filipino people convey the solidarity of his government and his alignment with both his constituents and the marginalized Filipinos. Duterte’s first State of Nation Address (SONA) may be described by the marked use of I inclusive we, and you; whereas, Pinoy’s may be described by the marked use of inclusive we. Duterte used the third person the least times; while, Pinoy used the second person the least. Analysis revealed that the two presidents’ person deictic markers position themselves with the Filipinos and convey their good intents as well as the goodness of their administrations, their sharing of responsibilities even with the commoners, and their building of hegemony of inclusion while communicating power, despite the difference in the frequency and choices of pronouns. Duterte appeared to be more consistent in his lexical choices and use of pronominals. DIMACULANGAN, Nimfa G.; DIMACULANGAN, Ma. Cezanne D.. HEGEMONY IN PNOY’S AND DUTERTE’S 1ST STATE OF NATION ADDRESS: A CRITICAL DISCOURSE ANALYSIS OF PERSON DEIXIS. JATI - JOURNAL OF SOUTHEAST ASIAN STUDIES, [S.l. ], v. 23, n. 2, p. 152-180, dec. 2018. ISSN 2600-8653. Available at: <https://jati.um.edu.my/article/view/15417>. Date accessed: 26 apr. 2019. doi: https://doi.org/10.22452/jati.vol23no2.8.